Jill is the Director at Carnegie Regional Library in Grafton, ND where she has been for just under six years. She is a proud mother of a soon to be 15 year old son, who enjoys as close to "equal time" as possible with both his parents. His success is all the proof Jill needs! Jill loves children and wants to be a part of making this world a better place for them to live and flourish. Jill has been a Leader in the pursuit of Equally Shared Parenting in North Dakota. Most recently, Jill submitted a petition to the Secretary of State to have a Shared Parenting Ballot Initiative during the 2014 election. Jill ensured all of the 25 named sponsors of the petition were Women to show their support for Equally Shared Parenting. Jill also has previous legislative experience having pursued an anti-bullying Bill in North Dakota which was signed into Law in 2011. 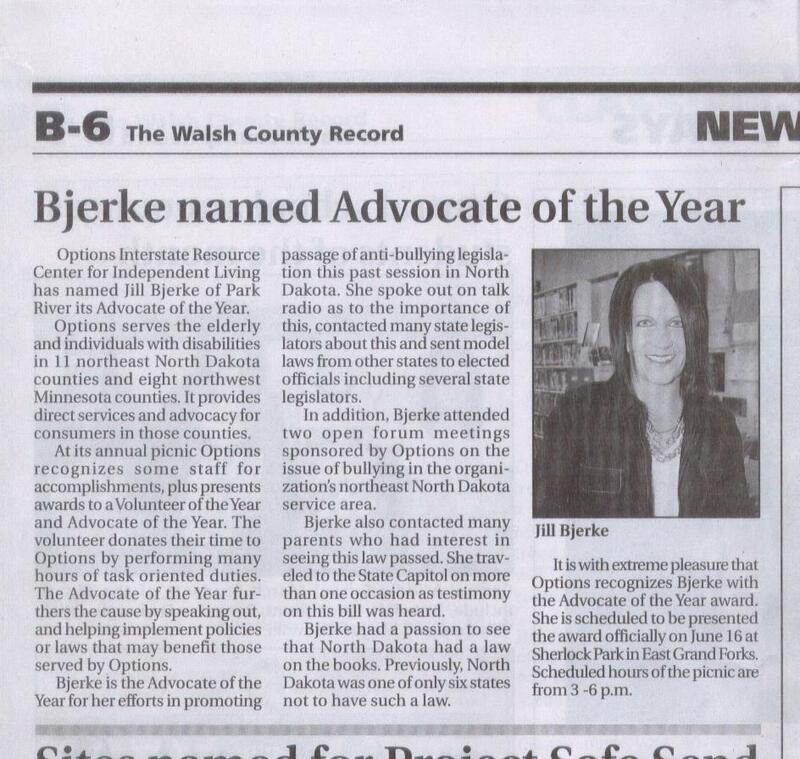 For her success in passing the Anti-Bullying Law, Jill was named Advocate of the Year by Options Interstate Resource Center. Following are some articles detailing Jill's recent work.